I wrote this shortly after arriving into Hong Kong, because I wanted my thoughts to be clear and present (of course then I let it sit a month). To start, the flight out was a 16.5 hour flight from Dallas-Fort Worth (DFW) to Hong Kong (HKG). The captain didn’t mince his words: “We’ll be together for a while” he said in his introduction. Cut to our departing the flight when I asked the crew how long they stayed – 42 hours they said… Guess my wife and I will be spending even more time than we thought with them on this short trip—and that’s not a bad thing. 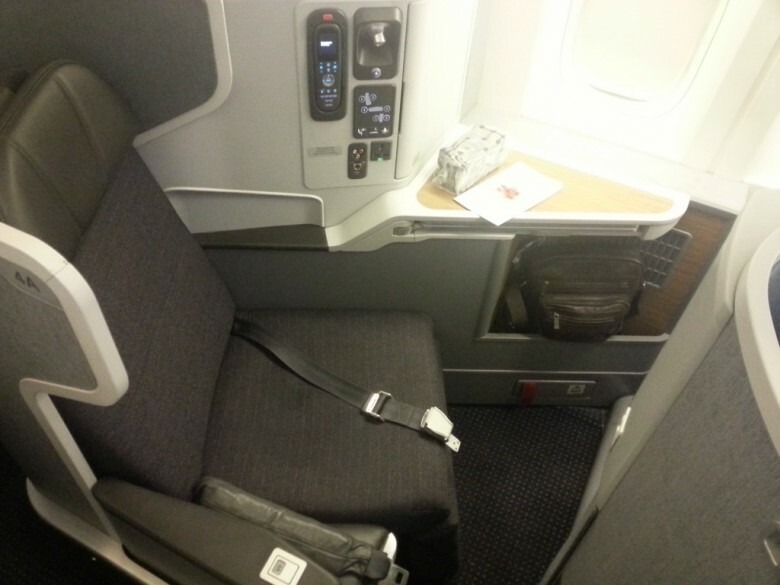 I have been anxious to fly American’s 777-300ER (referred to as a 77W), particularly because of the reverse herringbone seats that Lucky and others believe are the best options out there. I flew Qatar’s 787 with reverse herringbone seats, and while the IFE was phenomenal, the seat didn’t strike me as “the best.” This experience cemented that feeling. Yes, everyone gets access to the aisle. Yes, it’s a layflat (so quit bitching, you might say? ), but the seat feels tight, and when sitting and trying to work, kind’ve uncomfortable. That part is because the aisle-side armrest is parallel to the aisle (whereas the rest of the seat is angled away from it), so if you are the type that likes to have both elbows on the desk or the table or the armrest when you type, well this seat isn’t for you. Of course, one thing that did help the working across the Pacific, was the very affordable wi-fi (I think less than $20 for the entire flight), which was something of a novelty for me. Let’s cut to “bed mode”: This is a pretty comfortable bed in the sky. I’m 6’1”, and I could stretch out, and at no time did my stretching cause me to hit my head (as I’ve done when stretching out in other seats). The design was also good for “side sleepers” that like to bend their knees, there was plenty of room for one to do that. But, be aware, getting out of the seat when in bed mode, well, be prepared to have to climb out of the seat kind’ve like Luke Skywalker climbed out of his X-Wing fighter. It’s kind’ve fun and kind’ve awkward all at the same time. I felt the service was par for a US Flagged carrier. 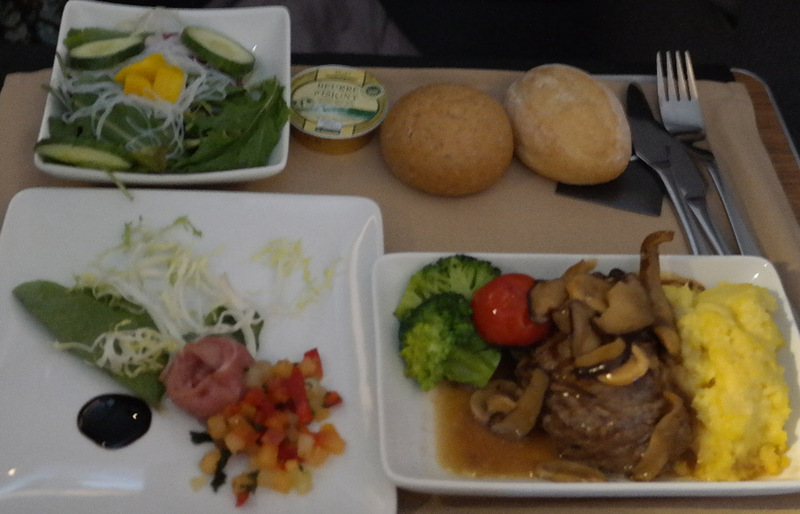 The menu was ok, although there was no drink menu provided, which I thought odd, for a premier international route such as this. Being able to pre-order the entre is great, but there were some seat swaps which led to some confusion. There was no issue with my meal though, so I just sort of “observed” the confusion, but not necessarily was I a part of it. I did feel that we were sometimes “forgotten” in the “mini-cabin” behind First Class. I’ll get to that in the next section though. Otherwise, the crew were very kind, not terribly talkative, because it seemed like they were working quite hard the entire flight. When I selected seats for our outbound, I was kind’ve excited to try the “mini-cabin” experience. For reference, there are two rows of business class seats, behind First Class, but ahead of the galley area. Logically, you’d think that the mini-cabin, right behind First Class would be nice. Private, perhaps even quieter because no one should be walking the aisle, right? Wrong, well, except the last part. Sitting in 4a, as SeatGuru rightly warns, is less than desirable. The clinking and clanking of dishes in the kitchen was almost bad enough to put in earplugs. What really got me though, was that we received our meals last. We were not in the private mini-cabin, we were in the forgotten cabin! It became abundantly clear when we were boarding the flight home that the flight attendants knew it too. One specifically commented on our different seats and asked if we had felt neglected in the mini-cabin. Overall, my wife and I really enjoyed the flights, so much so, that we’d have no issue flying the American 77W in business again. That said, I wouldn’t go out of my way to fly it, unless we were comparing it to American’s 772 with the angled layflat 2-3-2 business class seat. I found the seats especially comfortable to sleep in, but not especially convenient to work in. The cabin felt more claustrophobic than the Qatar 787, I think this was mostly due to the higher seat walls. 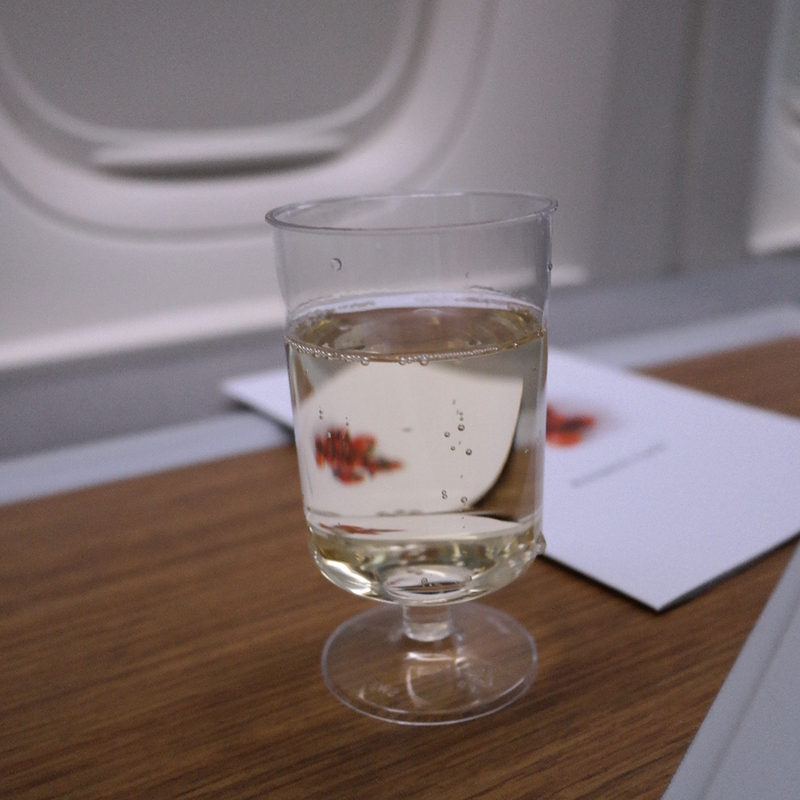 We ended up booking this flight for just under $1,000 round trip, and this was palatable for me because I was able to hold the flights, and call up the Executive Platinum line to confirm the upgrades at booking. I had checked ExpertFlyer to verify the availability before calling. With American’s every so often sales to Asia, the 77W is definitely the way to go, if you can confirm the upgrades! Great write up Trevor, is good to get a different and fresh perspective on this subject, especially when it is this candid! @Aptraveler – Thanks! Have you had the chance to fly American’s 77W or any Reverse Herringbone seat? No yet, but after ALL I heard regarding AA’s I’m still looking forward to trying it. Even if from looking at the pics, and after what you shared, those seats are a bit narrow! Great post Trevor…the only problem, only towards the end of your report I realized you are writing about business class seat as oppose to First Class..